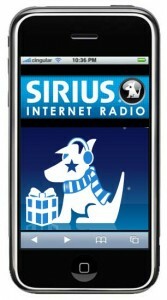 Sirius-XM iPhone app finally on its way! Sirius XM has revealed a screen shot of the soon to be released iPhone/iPod touch app that will stream the satellite channels to eager listeners. Becauseâ€”wellâ€”I’ve been waiting for well over a year along with every other Sirius and XM satellite radio subscriber. Yeah, it’s great that I can listen to the Sirius-XM stream at home or work using the Pulsar mac app, but in the car I’m stuck with using either Pandora or Last.fm (both are great for finding new music, but the streams are lower quality than I can deal with at times).